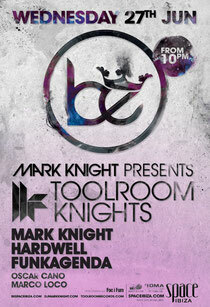 Toolroom Knights’ weekly Wednesday parties at Space in Ibiza have been doing well. With the season still not in full swing and many party-goers and holiday makers still to arrive on the island, Mark Knight’s weekly residency at Space is definitely on the ‘to do’ for thousands of Ibiza's clubbers. Clubbers definitely need a Knightime experience, he’s a top DJ and producer, and is part of the old skool, where he actually does the mixing! So far, guest appearances gracing the Toolroom terraza have already included Miguel Campbell, UMEK, Green Velvet, Sander van Doorn, Wally Lopez, Grandmaster Flash, Friendly Fires, FORZA and many more, with a plethora of top DJs and producers still to play throughout the summer. This Wednesday, Dutch DJ Hardwell and Toolroom favourite Funkagenda join Mark Knight, followed by an enormous 4th of July party with US megastars Kelis and Kaskade. Still to join the party this season, Fedde le Grand, John Dahlback, Michael Woods, Riva Starr, Fenech Soler, Butch, D. Ramierz, Stefano Noferini, Koen Groeneveld, Sharam, Kim Fai, and Sister Bliss. For more info, check out www.bespaceibiza.com and www.toolroomrecords.com. Have a listen to some classic Mark Knight production below.